When I was in high school, a remarkable music teacher introduced me to some recordings of Christmas music by a group called the Elizabethan Singers, led by Louis Halsey. The records featured mid-twentieth-century arrangements of traditional carols, some of which were familiar (“Away in a Manger,” to the tune CRADLE SONG, in a delicate setting by Hugo Cole, or “Good King Wenceslas,” arranged by Malcolm Williamson, or “The Holly and the Ivy,” set by Benjamin Britten). But many of the arrangements were of texts and tunes I had never heard, but which have since become as familiar as “Silent Night,” and much more treasured as they are less susceptible to treacly renditions. I heard and began singing these mid-century arrangements in the late 1960s, which made them contemporary Christian music. But what captivated me was not the contemporaneousness but the capacity of the music to be both emotionally engaging and intellectually compelling, and thus a more suitable and versatile vessel for expressing the realities revealed in the Nativity of our Lord. The musical vocabulary of these carols have an organic connection with much earlier music; the musical imagination of composers such as Rubbra and Britten (and their much younger successors) was, after all, shaped by a centuries-long tradition of sacred choral composition. Within that tradition is a commitment to make the singing and hearing of music within the liturgy into a musical re-enactment — not just a narration or description — of the mysteries beneath the events of God’s engagement with Man. 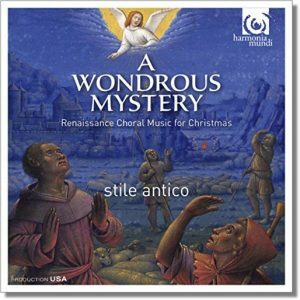 None of those mysteries is more central than the Incarnation, which is one reason why some of the most imaginative music in the tradition is associated with Christmas. In the historic liturgy of the Church, the Antiphon to the Magnificat appointed to be sung on the vespers on Christmas Day is “Hodie Christus natus est.” “Today Christ is born. Today the Savior appeared. Today on Earth the angels sing, archangels rejoice. Today the righteous rejoice, saying: Glory to God in the highest. Alleluia.” Not surprisingly, there are hundreds of settings of this text, but the ones that display the theme of glory most fully are those inspired by the Venetian polychoral style of the late Renaissance and early Baroque period. In this style, choirs bounce musical phrases back and forth, reinforced in producing their glorious sound by robust brass choirs. It is a fitting form for singing lots of “Gloria” and “Alleluias,” for sonically enacting glory and not just singing about it. Giovanni Gabrieli’s two settings of the “Hodie,” one for two four-part choirs, one for two five-part choirs — are among the most famous. Heinrich Schütz — a German trained by Gabrielli — also composed a “Hodie” that would have made his Venetian teachers proud. Other Renaissance masters who set this text include Giovanni Pierluigi da Palestrina and Jan Sweelinck. In addition to the theme of glory represented in Christmas music (including many hymns and carols), there are also the more metaphysical mysteries of the Virgin Birth and the Incarnation, both of which have been subjects treated by composers to great effect. Two examples will have to suffice in this short space. Josquin’s setting is for seven vocal parts, three high, three low, and one in the middle. The dramatic texture of the work relies on contrasts and interactions between the upper and lower voices. The first several lines of the music — the initial announcement of the uniqueness and strangeness of this birth — are sung by two low bass lines, sounding as if they are emerging from the depths of the earth. (A conductor friend said that when he rehearsed this with his choir, he told them it should sound “spooky.”) I wonder whether Josquin had Psalm 139 in mind, the passage in which the Psalmist says that his being was woven by God “in the depths of the earth.” Joaquin achieves a remarkable sense of supernatural (and subterranean) power with this opening effect.